Now, that’s what we call ‘best of both worlds’! The Cold shoulder and polka print together create an absolutely delightful combo. Slay in this navy bodycon dress with black heels and a vibrant pout! Add this fusion wear maxi tunic to your wardrobe and create the perfect indo-western look! Jazz up by adding a touch of bling with statement silver earrings. Nothing says classic graphics like a polka dot pattern. Blaze through work in style with this oh-so-perfect office shirt in polka dots. 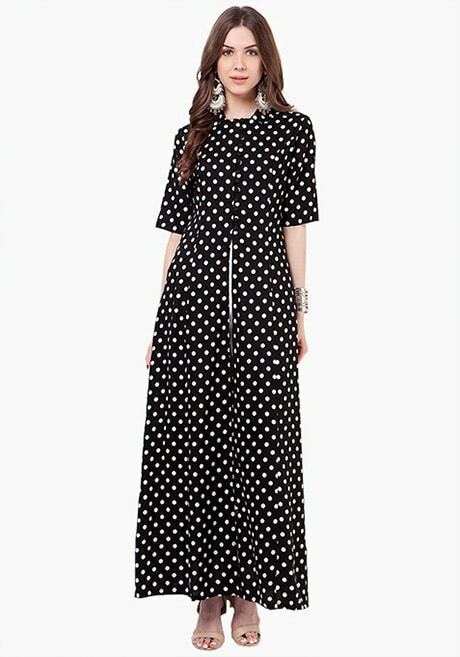 Add playful polka dots in your wardrobe with this boho chic maxi skirt. Take the charm quotient a notch higher by pairing it with a black off shoulder crop top.